The 4th bowl will scorch men and women who have blasphemed God. This judgment is particularly brutal in the fact that God has given the world thousands of years to except His plan for salvation in Jesus Christ but they have refused and curse Him for it. The 5th Bowl will be against the Satan’s Kingdom of the New World Order. The powers of darkness, who have ruled the earth throughout time such, will suffer this plague. The 6th Bowl will dry up the Euphrates River and present a straightaway for the Kings of the East to be gathered by way of the Unholy Trinity of Satan, The False Prophet, and the Beast. 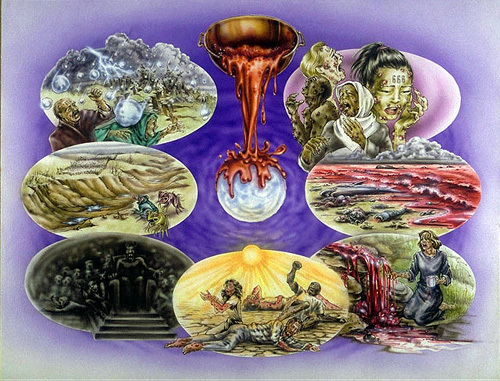 Revelation 16: 12-16 (NKJV) states, “Then the sixth angel poured out his bowl on the great river Euphrates, and its water was dried up, so that the way of the kings from the east might be prepared. And I saw three unclean spirits like frogs coming out of the mouth of the dragon, out of the mouth of the beast, and out of the mouth of the false prophet. For they are spirits of demons, performing signs, which go out to the kings of the earth and of the whole world, to gather them to the battle of that great day of God Almighty. “Behold, I am coming as a thief. Blessed is he who watches, and keeps his garments, lest he walk naked and they see his shame. “And they gathered them together to the place called in Hebrew, Armageddon.